Citric Acid, Natural & Artificial Flavoring, Malic Acid, Sucralose, Acesulfame Potassium, Summer Red Powder (fruit & vegetable). Before consuming AminoFlow seek advice from a physician if you are unaware of your current health condition or have any pre-existing medical condition or if you are taking any other medication. Do not use if you are contemplating pregnancy, pregnant, nursing, prone to dehydration, or exposed to excessive heat. Reduce or discontinue use if sleeplessness, tremors, dizziness, nervousness, headaches, or heart palpitations occur. AminoFlow is only intended for use by healthy adults 18 years of age or older. Keep out of reach of children and pets. Store in a cool dry place away from direct sunlight. Citric Acid, Natural & Artificial Flavoring, Sucralose, and Acesulfame Potassium., Blue Shade (Color). Natural & Artificial Flavors (Milk), Citric Acid, Malic Acid, Sucralose, Beet Juice Powder (Color), and Acesulfame Potassium. Serious weight lifters and bodybuilders always take BCAAs during their workout, and also generally use an NO product pre workout to increase strength and pumps, but up until now the two have largely been kept apart in separate supplements. There have been a few cracks at bringing these bodybuilding cornerstones together, but the main problem with previous efforts is that they used only one NO booster -- and in limited doses -- and never enough for sustained long-lasting systems that the top nitric oxide supplements can provide. AmiNO Flow is the first product to address this weakness with a legit sustained NO boosting system along with legit high-quality BCAA support! Let's take a closer look at the ingredient profile, and how Muscle Elements has managed to pull this one off where other brands have failed. This is one of the most interesting bits of this formulation. These numbers probably jump out as unusual to longtime BCAA buyers, as the 2:1:1 ratio emphasizing leucine has pretty much become the unshakeable industry standard. 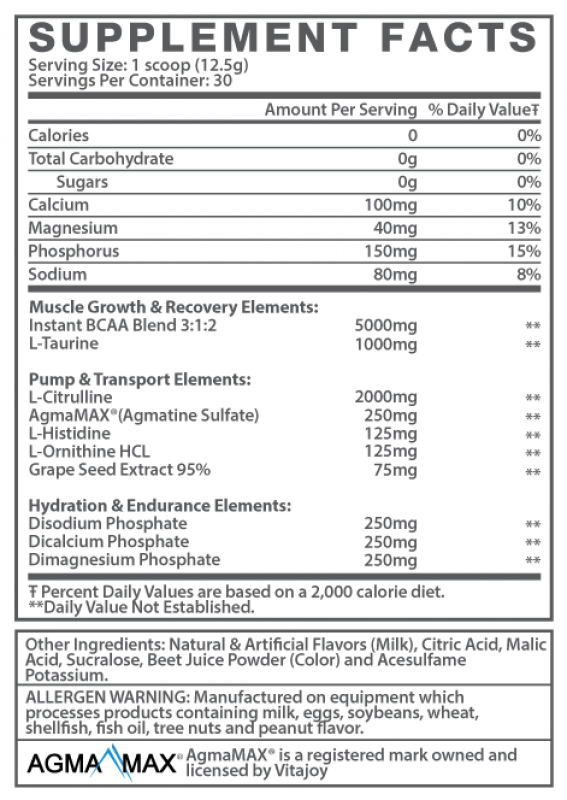 Another industry standard, there's not a whole lot to say about taurine at this point other than that it's got scientific backing for its ability to improve exercise capacity and hydrate muscle tissue, and we're happy to see it so long as it's not displacing BCAAs or hidden in a proprietary blend. Which it isn't here -- it's also dosed appropriately -- just like every other Muscle Elements supplement. On top of that, it helps with soreness and recovery, which is ironic because it's one of the ingredients that helps you blast your muscles to the next level in the first place! AgmaMAX is a trademarked agmatine sulfate formulation. We've seen it in more and more pre-workout products the past several years, and it's universally loved - nearly everyone is impressed with the pump and cognitive results. It works in tandem with the other pump enhancing ingredients to slow their breakdown process and keep them active longer. But to include it in an amino acid supplement is unheard of -- and weightlifters are loving the extra bit of juice it provides, especially if combined with a weaker pre workout supplement that may only include small doses of agmatine. This one simply puts you over the top. L-Histidine is one of the nine essential amino acids. It's not normally one specifically connected with muscle growth, functioning more centrally as an immune system supporter. But it's also been shown to spur production of carnosine, which in turn stimulates nitric oxide production. 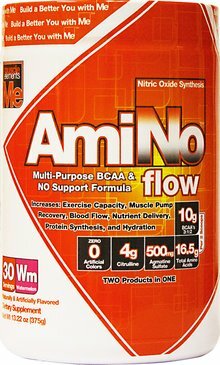 What's great about this ingredient is that it's in nearly no pre workout or nitric oxide supplement, so it's yet another way AmiNO Flow tops off the pump reserves for weight lifters. Starting to see a trend here? This product is that ingenious. L-Ornithine is another amino, and like the L-Histidine, it's here primarily to stimulate the production of something else. In this case, that something is arginine, which then may further stimulate more nitric oxide production. Once again, it's another ingredient most likely not found in your pre workout, adding another dimension. Grape seed extract function as a vasodilator, helping to improve blood flow throughout the body. The more readily blood can flow to muscle tissue, the bigger the pump you'll see. Disodium Phosphate, Dicalcium Phosphate, Dimagnesium Phosphate (250mg each): Your standard electrolytes for muscle tissue hydration and water retention. There's just so much to like about AmiNO Flow, moreso than any other BCAA supplement when you're looking at the weights in the gym. It's still dosed effectively for BCAA support -- but the sustained pumps are why it's so good. In fact, in a pinch, you could easily use this as a stimulant-free pre-workout supplement and have a bomber of a workout! And as you can see from our hands-on review, it stacks well with pre-workouts like PreCre since it's stim-free. You can even use it on its own as a pre-workout if you're so inclined! The AmiNO Flow Flavors: That fruit punch! We also really liked both the flavors -- watermelon and fruit punch. They're pretty heavy on the sweetness factor, but it's all sucralose, so no worries about calorie counting. As a group of reviewers who are kind of bored with fruit punch flavors, this is one fruit punch we actually keep coming back to! Normally, the heavy dose of citrulline (on top of the leucine) also adds a bitter flavor, so we're incredibly impressed with the flavor system... a little extra sweetness is an acceptable trade-off for not having any kind of nasty taste you'd have to sip throughout your workout! This is a premium product, and it's potentially removing the need for a separate BCAA or NO supplement - making it our favorite BCAA supplement for all types of weight lifters who want to get pumped.